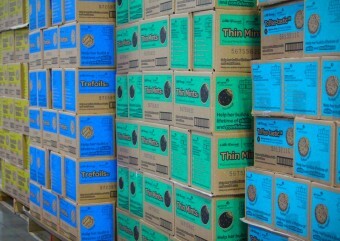 MELVINDALE, Mich., December 21, —For a second year, Girl Scouts of the USA (GSUSA) will work with Evans Distribution Systems to ship more than one million packages of cookies placed via its newly enhanced Digital Cookie platform out of Evans’ Detroit based fulfillment center. The online extension of the iconic Girl Scout Cookie platform launched in 2014 as Digital Cookie 1.0 with two separate ways for girls to market their online cookie business: by inviting customers to visit a personalized cookie website, or by taking in-person orders using a mobile app. Evans Distribution Systems is seeing great successes with its e-commerce, order fulfillment operation. As the 2015–2016 cookie season begins, Girl Scouts of the USA (GSUSA) builds on the initial success of Digital Cookie 1.0 by launching Digital Cookie 2.0, with dynamic, engaging, and interactive new tools and fun new upgrades that make learning and selling cookies more exciting and educational for girls. Digital Cookie 2.0 provides Girl Scouts the opportunity to sell cookies on a personalized website or mobile app to be fulfilled by Evans where the orders are picked, packed, and shipped out to the customers. “Evans takes great pride in their role as fulfillment partner for Little Brownie Bakers, serving the Girl Scouts. Their Midwest location allows them to quickly fulfill orders for our loyal Girl Scout cookie consumers across the country. Evans is a great partner, focused on customer service and the technological infrastructure needed to bring the Girl Scout Cookie Program into the digital age,” said Don Davis, VP of Sales, Little Brownie Bakers. The orders from Girl Scout personalized websites will be fulfilled out of Detroit. The fourth generation, family owned business is a staple in the Detroit area logistics industry and has been since its inception in 1929, 86 years ago. Evans also provides fulfillment services for Girl Scouts of Southeastern Michigan, as well as other Michigan based and international companies. Evans prides itself on providing unique and flexible solutions that are tailored for each customer, and serves various markets. The evolution of Evans includes a growing e-commerce, order fulfillment operation developed to keep up with the increasing demand in the global market for omni-channel and online shopping. “This has been a great experience. Working with an organization with such a deep rooted American tradition, and being able to create a unique solution for their organization is very rewarding, especially as the father of a Girl Scout myself,” said John A. Evans, president of Evans Distribution Systems. In 2013, the State of Michigan and the Michigan Economic Development Corporation (MEDC) comprised a strategic logistics and supply chain plan, with a focus on showcasing and utilizing Michigan’s strong logistics infrastructure. The partnership with GSUSA and Evans takes advantage of Detroit’s supply chain talent to create an efficient and successful strategy for order fulfillment here in Detroit. Evans has developed fulfillment technology that allows communication between a website, the shipper, and Evans’ own inventory software, providing real-time updates customers and end users. The technology can connect to Google and Amazon stores, mobile apps, and e-commerce platforms such as Magento, Shopify, BigCommerce, and others. This allows Evans the ability to offer its customers a true omni-channel solution for order fulfillment. In addition, Evans will pick, pack, and ship orders out of the Detroit facility utilizing UPS, USPS, or FedEx. The growing fulfillment service gives customers the ability to use custom packaging and marketing inserts and promotions in their packages, dynamically targeting their customers through the fulfillment process. E-commerce and order fulfillment is becoming a large part of many organizations, with an annual growth rate of nearly 19 percent since 2000 according to the Journal of Commerce. Omni-channel e-commerce is the latest buzz, referring to multiple channels of ordering, allowing marketers to reach customers across all platforms and devices. Evans Distribution Systems, headquartered in southeast Michigan, was founded in 1929 as the Central Detroit Warehouse Company. It has evolved into a full-service, third-party logistics provider offering warehousing, transportation, contract packaging, fulfillment, and staffing to the manufacturing, food and beverage, consumer goods, and chemical industries. Evans currently employs more than 700 associates and operates over two million square feet of space in Michigan and across the U.S. Find more information on our website, easierwithevans.com. Read the latest supply chain insights at Evans’ blog, or follow the company on Facebook and Twitter. Click here for the PDF of this press release.